FRASER’s many options for browsing materials range from a timeline of publication dates to hyperlinked finding aids for selected collections. Two of the most commonly used, however—and the most easily confused—are themes and subjects. Both themes and subjects allow users to browse topical collections of FRASER materials, but there are some differences between the two. Themes are topical collections that contain materials selected by FRASER librarians. Themes fall into two general categories: “greatest hits” collections and compendium collections. Greatest hits collections like “Inflation and Prices” highlight popular or more useful documents on a given topic. Compendium collections like the Federal Reserve Statistical Releases bring together materials on a given topic and provide context with an explanatory note. Themes may also offer related links to websites at other institutions that provide additional or more in-depth information on the topic. Some themes, like “Depressions and Panics,” may also have subthemes that focus on a narrower topic, like the Financial Crisis of 2007-2009. 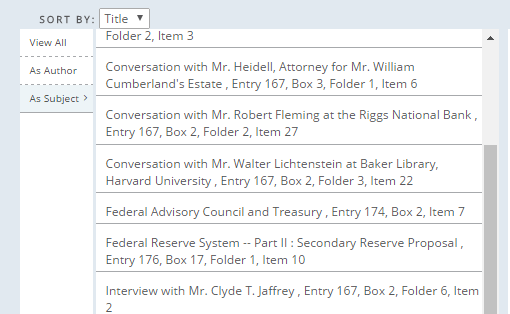 Curated timelines like the chronology of the Federal Reserve Chair are also a type of sub-theme found within the “Browse by Theme” menu and are intended to provide additional historical context for FRASER materials. A given document, title, or archival collection is generally assigned to only one theme, but most FRASER documents have more than one subject. As in other libraries, FRASER subject headings are intended to link documents on the same topic. Although every subject heading has a web page—like this one for labor—subjects are primarily intended to help users browse through FRASER documents and are not intended as a starting point for research. FRASER uses Library of Congress subject headings for the majority of its subjects but has added additional subjects specific to economic and Federal Reserve history, like the 1951 Treasury and Federal Reserve Accord. Some subject headings have links to related subjects or authors, which can help you find your way to the most relevant materials. Other subject headings have a brief abstract to help you better understand the associated FRASER content. Regardless of which path you take to the documents you need, the FRASER team is dedicated to helping you find the best materials for your research topic. If you need additional assistance, you’re welcome to contact a librarian for help.